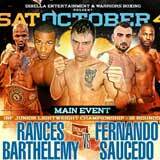 Review: 2014-10-04, pretty good fight between Rances Barthelemy and Fernando Saucedo: it gets three stars. The undefeated Rances Barthelemy entered this fight with a perfect record of 20-0-0 (12 knockouts) and he is ranked as the No.6 super featherweight in the world (currently the #1 in this division is Mikey Garcia); he has already fought twice in 2014 beating twice Argenis Mendez (=Mendez vs Barthelemy I and Mendez vs Barthelemy II). His opponent, Fernando David Saucedo, has an official record of 52-5-3 (8 knockouts) and he entered as the No.36 in the same weight class, he suffered his last loss in 2010 when he faced then-undefeated Chris John in a fight valid for the Wba Fw title, since then he has won 14 consecutive fights beating in his last bout Luis Armando Juarez. Barthelemy vs Saucedo is valid for the IBF super featherweight title (Barthelemy’s first defense). Watch the video and rate this fight!